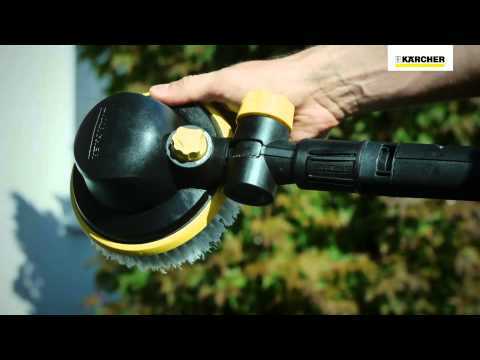 The Kärcher WB100 rotating wash brush is perfect for cleaning all smooth surfaces, e.g. paint, glass or plastic. This wash brush comes with a number of features allowing for a superior clean with the minimum of effort: rotating bristles with gentle cleaning action, 180° infinitely adjustable joint on handle for cleaning difficult to reach areas , infinitely adjustable speed and detergent dosing, easy to change brush attachment, outer protector ring for protection against scratches and union nut for secure gun connection. This brush is suitable for all Kärcher K2 – K7 series pressure washers making it a great addition to your outdoor cleaning kit.